Xiaomi, the Chinese manufacturer entered the Indian market with its Mi 3 smartphone and the smartphone turned out to be a huge success in the country. The unbelievable price tag it carried helped the device sell like hot cakes. Now, the stakes are quite high for its successor and Xiaomi will hoping that its latest introduction, the Mi 4 will be able to replicate the sales performance of its predecessor. 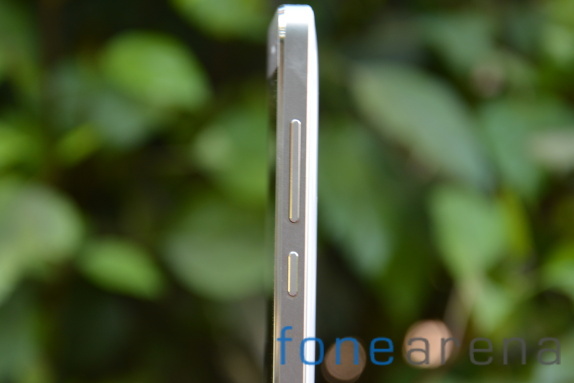 We had a chance to spend some quality time with the Mi 4 and here’s what we think about the smartphone. Xiaomi’s smartphones have also retailed in an eco-friendly package with very minimalistic looks and it isn’t any different for the Mi 4 either. The company isn’t keen on packing anything other than the basic required accessories and it does help in keeping the retail costs down. The box just contains an A/C adapter and a microUSB cable along with some leaflets. 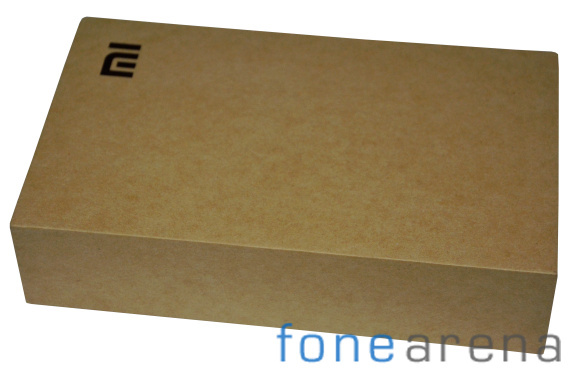 We had already managed to get the Chinese variant of the Mi 4 and give it an unboxing treatment. You can check the video below. Mind you, the packaging of the Indian variant isn’t any different. For starters, the Xiaomi Mi 4 has the same form factor as that of Mi 3. So, you might now be wondering what’s new about the Mi 4? Well, the fourth generation Mi smartphone now comes with a metal frame, which gives more solid and premium feel. And, also there’s a new glossy plastic panel for the rear cover that you can replace with a wide range of options such as bamboo and stone. We appreciate the fact that the components used in the construction of Mi 4 are first grade. Xiaomi Mi 4 has a smaller footprint than that of its predecessor, largely thanks to the slimmer screen bezels. The Mi 4 measures 139.2 x 68.5 x 8.9mm – which is about half a centimetre shorter and narrower than the Mi 3. The device weighs about 149 grams, up by 4 grams when compared to Mi 3, but the difference is hardly noticeable. The Mi 4 comes with a new design language and the device no longer has the polycarbonate unibody. The overall visual appearance has drastically changed. While the Mi 3 came with Nokia like aesthetics, the new model has an effortlessly elegant artistry. The spotlight falls on the stainless steel frame, which gives the device much deserved premium feel. The rear cover is made of glossy plastic and it’s needless to say that it is prone to fingerprints and smudges. 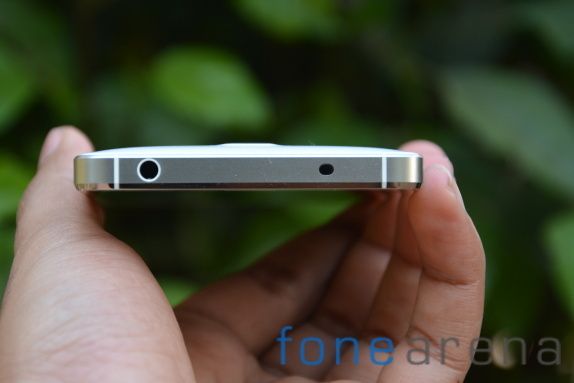 The back panel on the Mi 4 is removable and you can swap them with some custom designed cool looking designs. However, there are 17 clips holding the rear panel tight and it is not readily removable. You will have to use a small suction cup to pull the back out. Xiaomi Mi 4 feels solid in the hands and even though the back is a bit slipper, the grip metal frame provides more than makes up for it. The device might not be the most compact smartphone around, but it is compact enough to slip easily into the pockets. The only design flaw that we notice is the lack of microSD card slot. Of course, it is not unexpected considering the fact that no Mi flagship except the very first one came out with expandable storage. There’s 64GB variant that solves the memory issue, but the one that is currently being sold in India comes out of the box with 16GB of storage space out of which about 11GB is available for users. The entire front of the Xiaomi Mi 4 is occupied by the 5-inch display and we are happy to report that the bezels have gotten a lot thinner. Above the screen, there’s an earpiece, 8 megapixel front facing camera and a bunch of sensors. Xiaomi has gone with the capacitive touch buttons and its good move considering they are not wasting the screen estate. The three buttons are menu, home and back keys. Moving on, the right side of the device features the volume rockers and power key. The buttons are made up of metal and they offer good feedback. The microSIM slot can be found on the left and apart from it, everything else is bare. The 3.5mm audio jack and the IR blaster are placed on top of the device. With the help right applications, the infrared port offers you to control various home appliances such as televisions, media players and air conditioners. 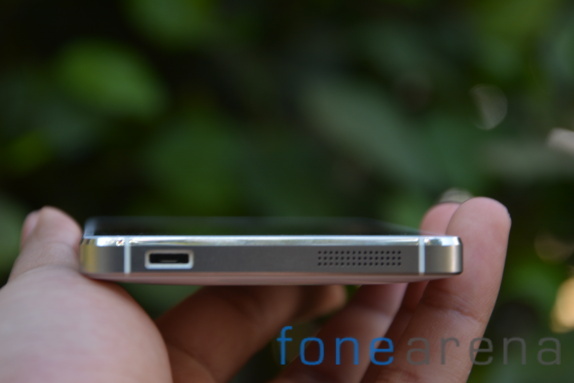 On the bottom, you can locate the microUSB port on the left corner. There’s also a fairly largely grille that holds the primary microphone pinhole and the loudspeaker. Xiaomi Mi 4’s rear holds the 13 megapixel rear camera, which is accompanied by a LED flash. Underneath the back panel is a 3,080mAh battery that is not user replaceable. The Xiaomi Mi 4 sports a 5-inch IPS display with a resolution of 1080 x 1920 pixels and accounts to an eye-watering pixel density of 441ppi, which is among the best out there. The screen is protected by a layer of Gorilla Glass OGS that prevents minor scratches and sniffs. 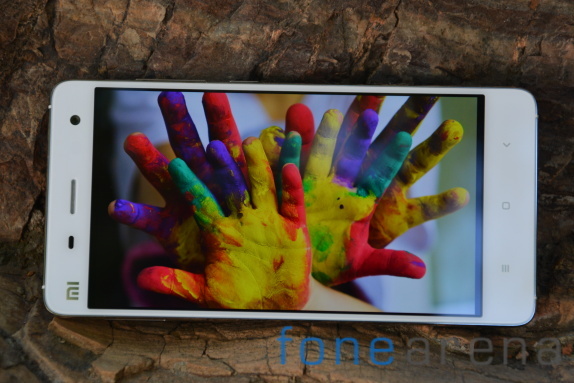 The Mi 4 display has good contrast and colors. The brightness level has been increased and the screen backlight is more uniform as compared to Mi 3. Xiaomi allows you to tweak with the color temperature and saturation, so you can now set the display to match your likings. The sunlight legibility has been enhanced and you no longer need to hide the Mi 4’s display from the sun to access the smartphone. One last feature that we would like to talk in this section is the software feature that prevents accidental screen unlocks. When enabled, you cannot unlock the screen when the proximity sensor is covered. The Mi 4 is the first Xiaomi smartphone in the country to run on MIUI v6 based on Android 4.4 KitKat. The latest version of the ROM brings a visual overhaul with more colourful, looks, new phone features and enhanced security. MIUI 6 is less distracting and the user interface is quite simple. The company claims that one need not waste time familiarizing with the UI and can simple dive in to it right away – it’s that simple! Vibrant colors and animations play a big part in the MIUI 6. All the major application that come preinstalled are in red, orange and spectrum of other colors. From calendar to music player, each icon has been coloured with personality. While, applications like clock that comes with immersive parallax effect suggest that MIUI 6 design is a lot closer to iOS – it’s actually way different from Apple’s mobile OS. 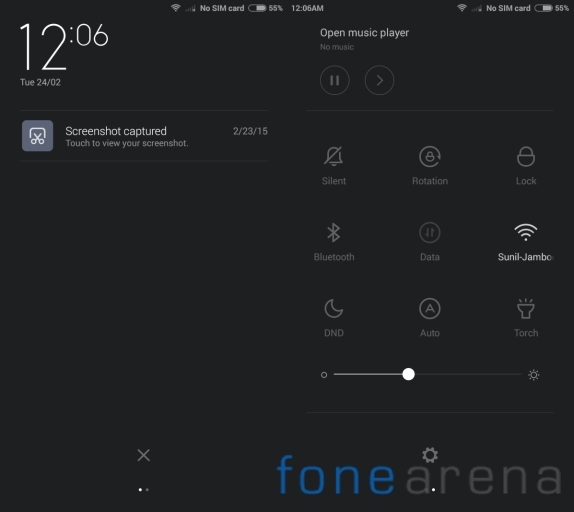 The MIUI 6 also has some new gestures for the home screen and the notification shade has been completely redesigned with toggles for various settings. You can batch organize icons, quick search tools and it’s fun to use them. The notification center has been enhanced and it now shows notifications on top of the screen. You can easily view details or even open app quickly with just a single tap. 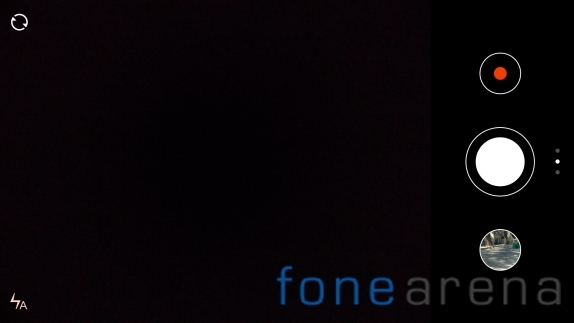 The notification system is also capable of switching over to floating notifications to avoid interrupting when you are playing a game or when using the camera. Customization has always been a key component of MIUI and it isn’t any different with the latest version of the ROM. 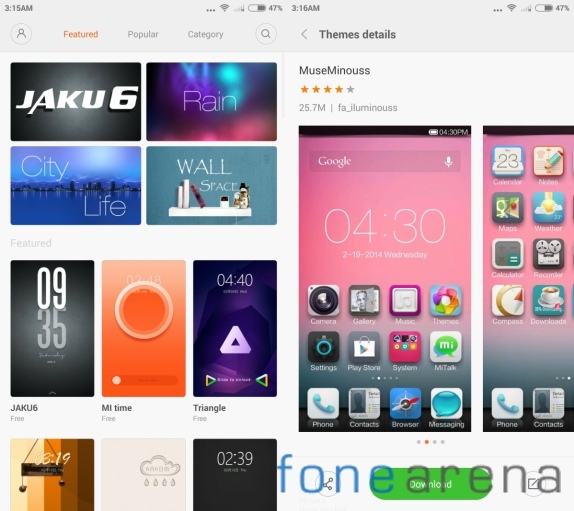 The theme store now has more than 5,000 MIUI themes that lets you customize your phone the way you want it to be. 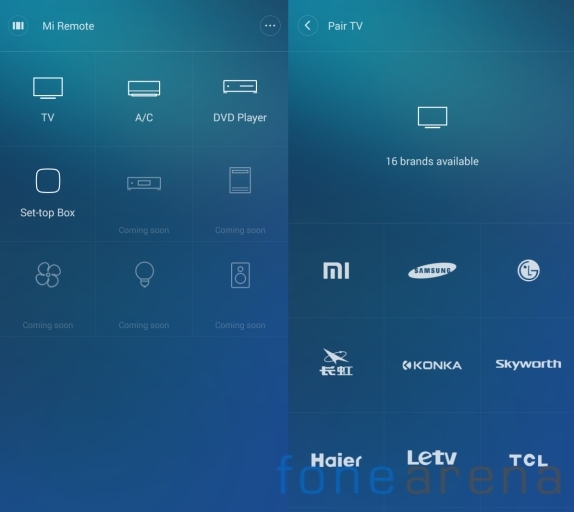 As we said earlier, the MIUI 6 brings lot of useful tools and one of them is Mi Remote. The application uses the infrared port in order to control some of your electronics. At the moment, you can use the app to connect your television, air conditioner, DVD player and set top box. 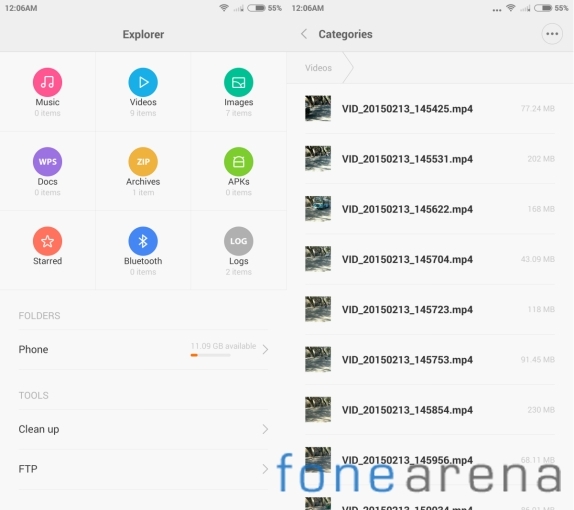 Xiaomi Mi 4 also has a great file managing application named Explorer on board. The app offers various features and we liked it a lot. The only drawback is that there’s no document viewer or editor pre-installed, but considering the fact that plenty of free options are available in the play store, this might not be a real concern. The built in security app in MIUI 6 is very sophisticated, so you really don’t have to worry about malicious apps or viruses getting into your phone. 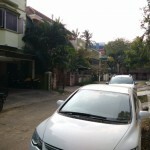 The software also enhances the battery performance with the introduction of various Linux kernel and RAM optimization techniques. Overall, MIUI 6 is a nice touch and we really liked the animations it has got to offer. Xiaomi Mi 4 is powered by Snapdragon 801 chipset, which is one of the fastest in the market with quad-core 2.5GHz processor and Adreno 330GPU. And, add 3GB of RAM (2GB useable at boot) to it – the performance should be top notch and of course we expect it to be very smooth. 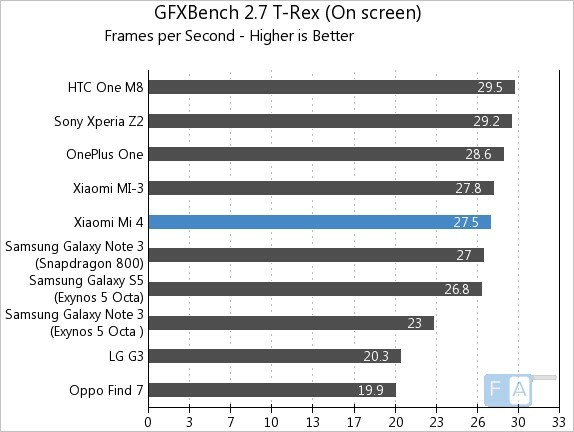 We ran a couple of benchmarking tests to gauge the performance of the Mi 4 and also to stack it up against the other flagship smartphones. Here are the results for you. 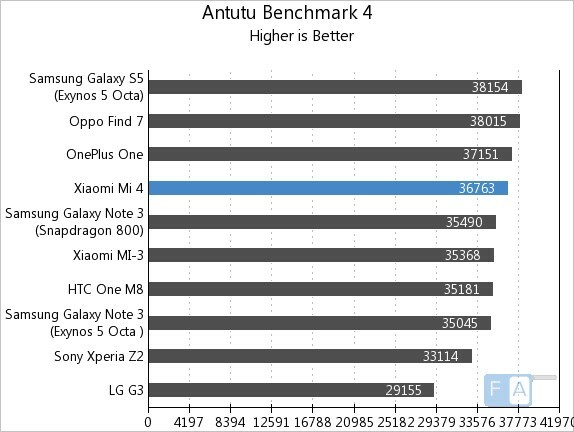 The first challenge was the AnTuTu benchmarking that reveals the overall performance of the smartphone. 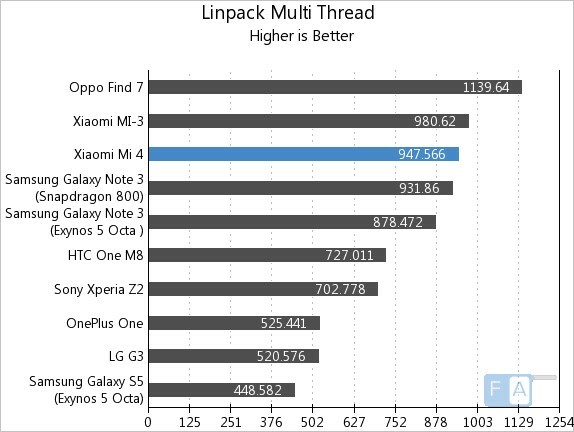 Xiaomi Mi 4 with a score of 36,763 passes the test with flying colors. Second up was the Linkpack test, which measures the multi-threaded oriented benchmarking of the phone. 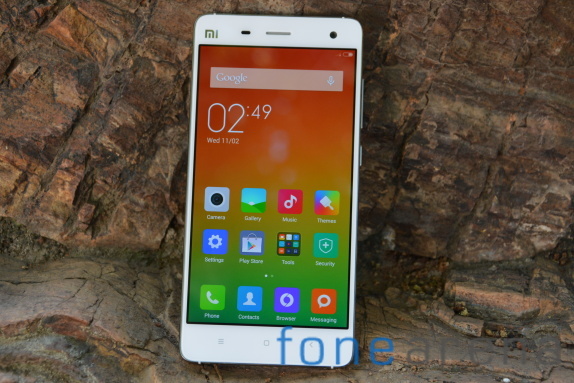 Again, the Xiaomi Mi 4 found itself among the best smartphones out there. 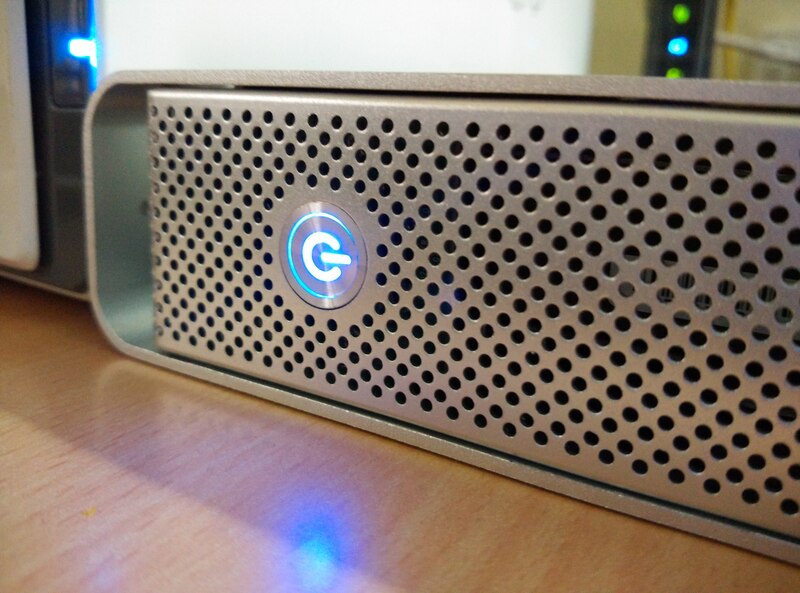 We then had the Adreno 330 GPU sweating it out in the GFX benchmarking. If you aren’t aware of GFX, this test reveals the raw performance of the GPU. 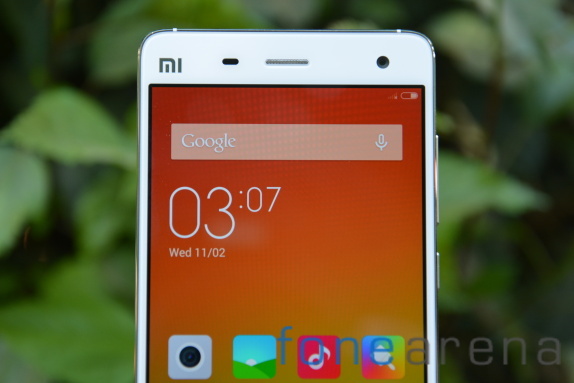 With a score of 27.5 points, the Xiaomi Mi 4 didn’t fail to impress us. 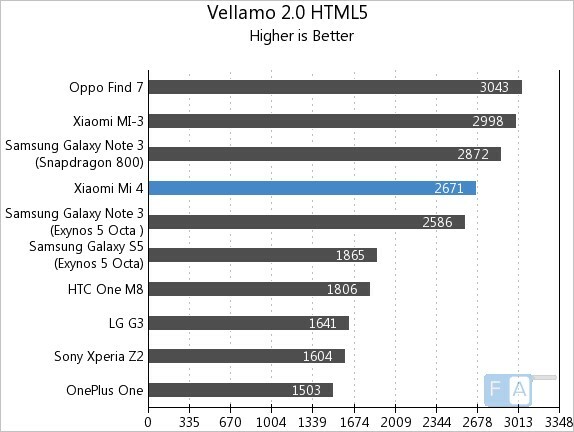 Lastly, we gauged the browsing performance of the smartphone with the help of Vellamo benchmarking. 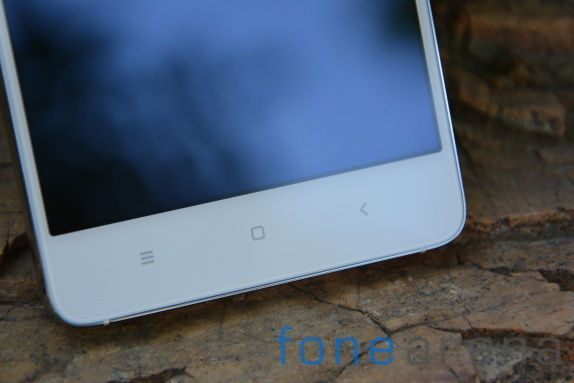 The test revealed that Mi 4 is surely one of the best compact devices for web browsing. 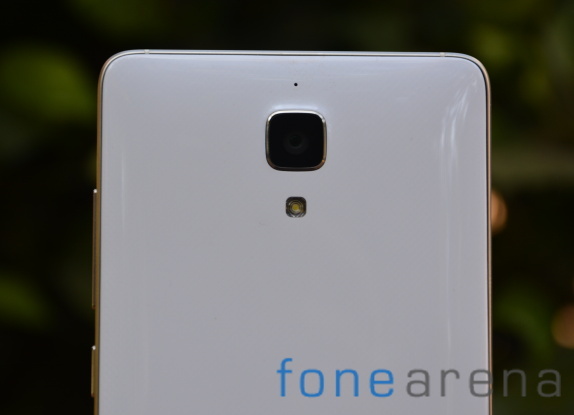 Xiaomi Mi 4 is equipped with a 13 megapixel rear camera with a 1/3” Sony made sensor. 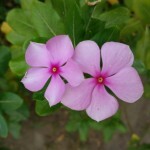 The Mi 4 shooter is one of the few smartphone snapper to have f/1.8 aperture. There’s also an LED flash to help you capture quality images during low light conditions. 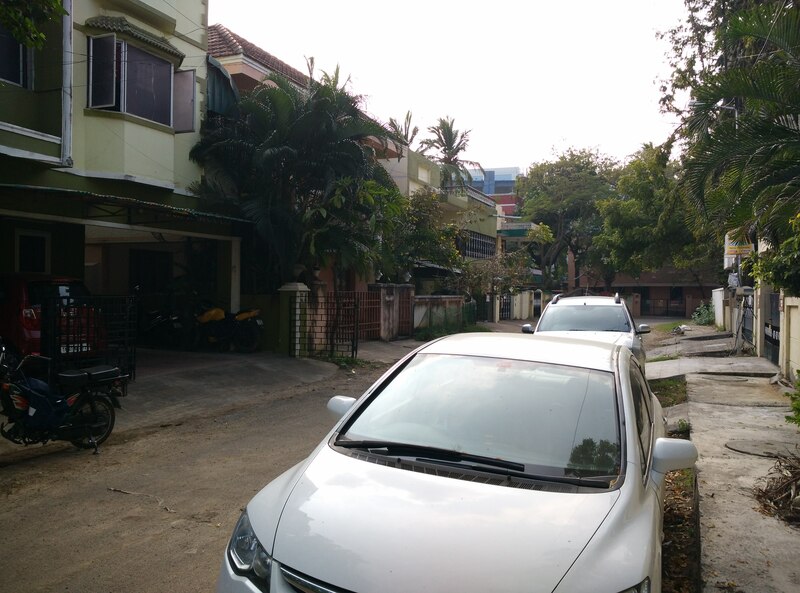 The camera interface on the Mi 4 is quite standard with all options categorized in two bars. The left side bar has the front facing camera shortcut, camera button and flash settings. On the right, you can see the settings toggle, camera shutter key and gallery shortcut. In the settings tab, you can select options such as HDR, scenes, focus mode, white balance, exposure and ISO among other things. If you dig deeper, you can find the additional settings which houses the face detection and image stabilization options. 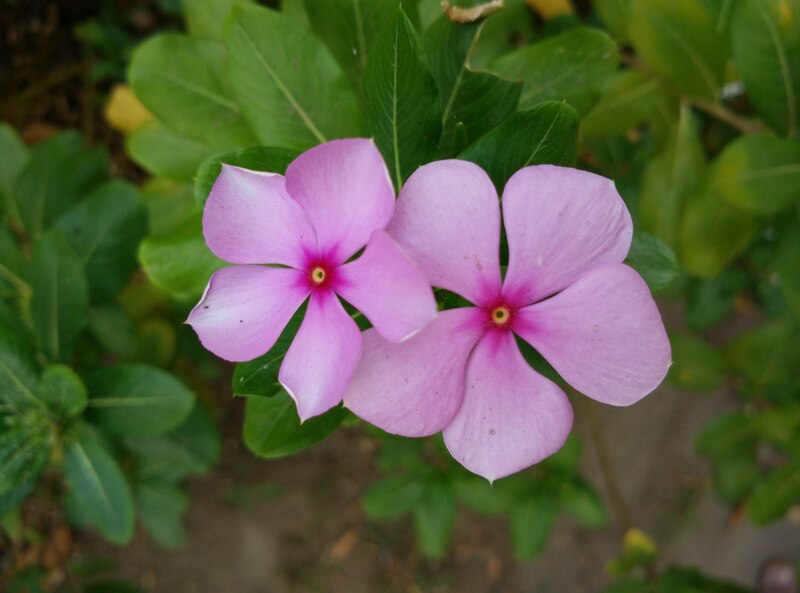 The color reproduction offered by the Mi 4’s camera is quite accurate and there’s no lack of detail. More often than not the white balance is right, but there’s some over sharpening at times. The noise levels are a tad high than what we expected. You can capture images in HDR mode as well and both the highlights and shadows are conservative. 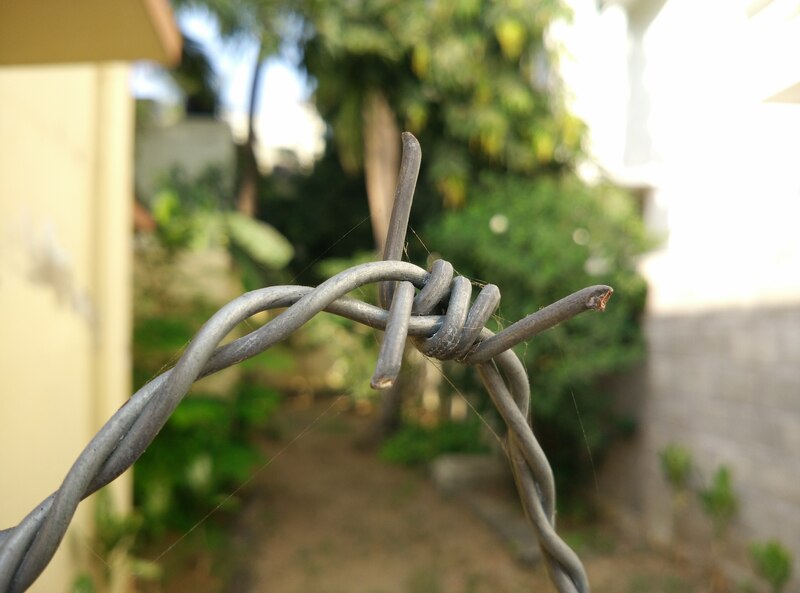 The Mi 4’s camera also has the ability to shoot panorama shots in both landscape and portrait. The portrait shots come out with 3400 x 1200 pixels while the landscape panoramas have a maximum resolution of 4000 x 700 pixels. The stitching takes about a minute and we weren’t too impressed with its quality. Xiaomi Mi 4 comes with an unprecedented 8 megapixel front facing camera that offers high resolution selfies. The detail of the image and its color rendering is quite impressive. This is perhaps the best front facing shooter we have seen in the recent time. Talking about the video recording ability of the Mi 4 – the device is capable of capturing 2160p@30 fps and 1080p@30 fps clips. The 4K videos have a bit rate of 40Mbps and audio is captured at 96Kbps with 2 channels. We recorded a 4K video to show it to you all and you can find it below. There’s an option called image stabilization in Mi 4 that helps you keep the video steadier, but with this feature there’s a small drawback – the field of view is significantly lower. The Mi 4’s camera also offers you to capture 6 megapixel images during video recording. The detail level in the Full HD samples is quite good and the color rendering along with the contrast is pleasant. We are happy to report that the frame rate is consistent at 30 frames per second. The bitrate of the 1080p samples were recorded at 15Mbps. Xiaomi Mi 4 is one of the first smartphones to offer HDR videos in both 4K and 1080p recording modes. The HDR effect somehow doesn’t feel natural and you can check that in below videos. It’s unfortunate that the Indian model doesn’t support 4G LTE connectivity despite the smartphone being powered by a capable Snapdragon 801 chipset. Xiaomi Mi 4 has a wide range of connectivity such as dual-band Wi-Fi a/b/g/n/ac, Wi-Fi Direct, Bluetooth 4.0, GPS, GLONASS and FM radio. There’s an IR blaster as well that takes advantage of the software to control home appliances. While the Mi 3 featured NFC connectivity, the Mi 4 doesn’t support it. The company says that there were not many users who were using it and thus they did not bother to bring NFC on-board. Makes sense, right? You can also wirelessly screen your smartphone’s display using the Miracast protocol. Lastly, there’s a microUSB 2.0 port that supports USB on-the-go and handles charging. The juice for the Xiaomi Mi 4 comes from a 3,080mAh battery, which is expected to provide long hours of usage. Our battery test reveals that the device will last for about 9 hours and 47 minutes before it needs a recharge. 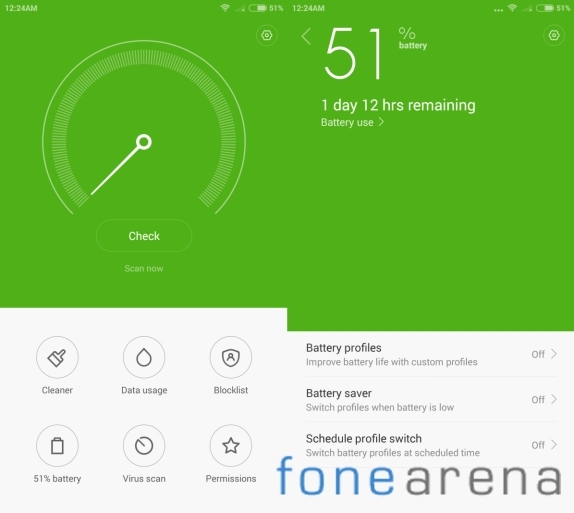 We will be posting a detailed breakdown of the Xiaomi Mi 4’s battery consumption on our blog in the next couple of days. So, stay tuned. Meanwhile, if you are wondering about out test, then feel free to check our battery test introduction to know more about our test procedure. Xiaomi Mi 4 is already available in the market for a price tag of INR 19,999 for the 16GB variant. The build quality of the device is great and the stainless steel frame adds elegance. While we liked the polycarbonate design from the Mi 3, the rich choice of rear covers that makes the device even more stylish almost helps us forget about the Mi 3’s uni-body. The display quality is on par with the competition and at this bargain price we doubt if it gets any better. There’s only one word to describe the performance of the Mi 4 – top notch! Xiaomi has managed to get the most out of the Snapdragon 801 silicon and the company has made sure that the device is future proof with the inclusion of 3GB of RAM. 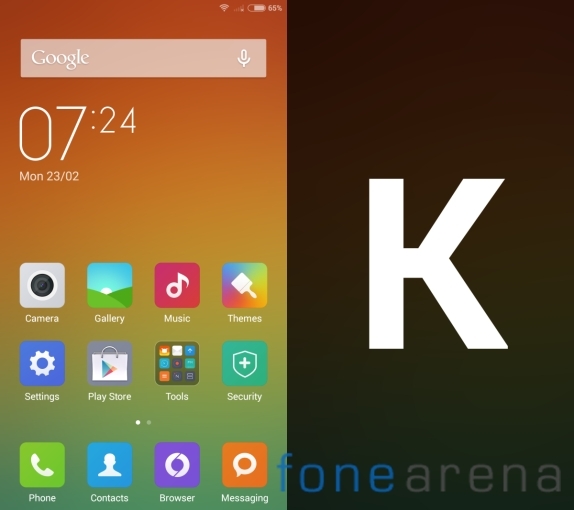 Xiaomi’s MIUI v6 based on Android 4.4 KitKat offers rich customization options and the UI is very responsive. The engineering team at Xiaomi has done a great work with the animations on the MIUI and they definitely deserve some applause. The Mi 4 has a pair of excellent cameras that captures excellent quality images and videos. 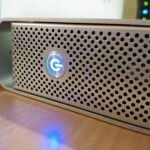 The battery life too is impressive and it should easily last for a day even for power users. Lack of LTE connectivity and microSD card slots are the only aspects we do not like and it could well be a deal breaker for many of you. Buying a 64GB model would solves the storage issue, but there’s nothing you could do about the connectivity. Xiaomi surely missed a trick by not bringing the LTE model and the company could lose some potential consumers to OnePlus. All things considered, Xiaomi Mi 4 is one of the best smartphones money can buy you. The price tag it comes with makes the deal even more sweeter. 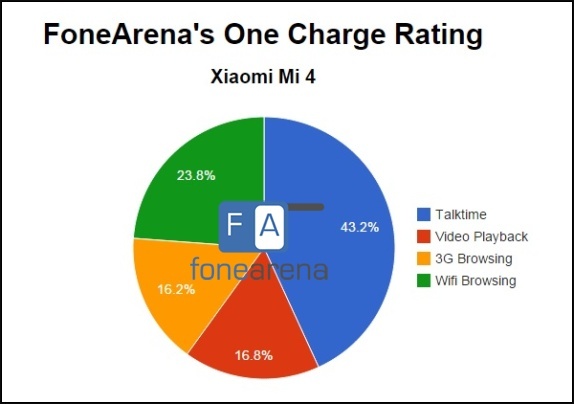 And, If you are out there looking for the definition of the phrase ‘bang for the buck’ then just look at Xiaomi Mi 4.